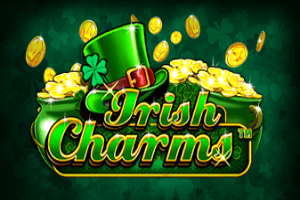 Irish Charms slot game is a delightful little game with more than a few opportunities to earn money. Developed by Pragmatic Play, this is an uncomplicated game that affords hours of enjoyment and quite a few surprises by way of prizes and freebies. The game’s throwback look is quite a refreshing change from the slick and over-animated games that are being made today. It also has a fairly unusual gameplay that players are sure to enjoy. Players who prefer gambling using their smartphones will be happy to know that the game is compatible with most smartphone and tablets. The game is not available in a few jurisdictions due to licensing issues. This is a tidy little game with three reels and three pay lines. Players can wager on any number of pay lines with bets up to 10 coins each. The smallest wager is 1p whereas the largest possible on any spin s £15. This makes it a really good game for people who like to keep their wagers within a tight budget. It goes without saying that high rollers are unlikely to find this game appealing. Payouts range from 2000 coins to 6000 coins depending on the symbols that land on the reels. While the jackpots are no doubt quite interesting, the game is not part of any of Pragmatic Play’s progressive jackpots. The game has an autoplay feature that players can make use if they don’t feel like pressing the spin button repeatedly. There is also a Betmax button for people who want to place the maximum possible bet directly. These features go a long way to remove the tedium from playing slot games and players use them to try for wins with the least possible effort. 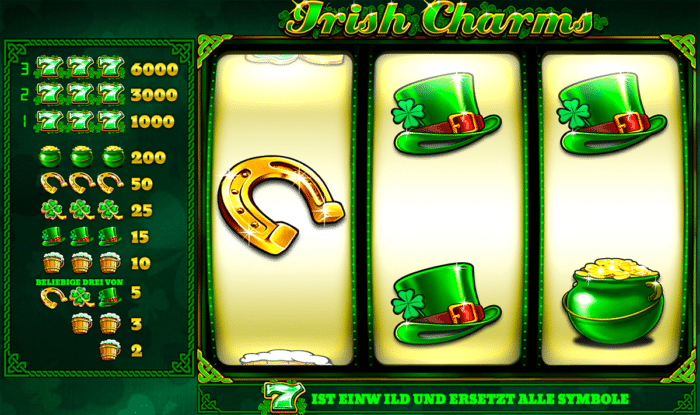 There isn’t a specific bonus game in the Irish Charms slot game, and this makes it one of the simplest games around. The game does have a Scatter symbol, that of beer glasses, and they give payouts even individually although the win size is one or two coins. The Irish Charms slot game does not offer any free spins. Players who are accustomed to getting free spins, and these are available at almost every slot game these days, are sure to be disappointed. The 7s symbol which gives the jackpot is also the game’s wild which means that it can take the place of the other symbols to complete combinations that can get wins. The 7s symbol triggers the game’s biggest wins. Getting three 7s lined up on a pay line results in a 1000 coin payout. If the line of 7s fill up two rows then the payout increases to 3000 coins. However, lines of 7s in all three rows gives a whopping 6000 coin win. The Pots of Gold symbol give 200 coins when three land on the reels. Three golden horseshoe symbols give 50 coins. Four-leaved clovers, leprechaun hats, and beer tankards give 25, 15, and 10 coins respectively. Interestingly, payouts are possible out of combinations of the horseshoe, leprechaun’s hat, and cover symbols. We feel that the Irish Charms slot is a light-hearted and uncomplicated game that is definitely worth giving a try. The 7s symbols land on the reels at a satisfyingly frequent rate and we were able to get a few wins. We are quite certain that players will also enjoy the ‘old school’ vibe of the game with its simple visuals and soundtrack. We recommend this game to players who love to play slots but aren’t too keen to wager huge sums of money.